This Dream Catcher Pipe Tobacco is just that – a dream to smoke! The full-bodied tobacco features a blend that’s made from perfectly air-cured Burley and flavorful Virginia tobaccos. The result is the perfect smoking tobacco for all! 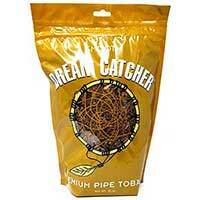 Dream Catcher Pipe Tobacco provides smokers with a full-profile experience that’s really hard to match or beat. You’ll get an even and consistent smoke with every hit you take. And thanks to its affordable pricing, you won’t have to spend a fortune to indulge a delightful smoke. This tobacco boasts a luscious and rich smoke with every inhale you take. The non-aromatic is cut evenly and placed in an airtight resealable bag to prevent any shake. You’ll be able to have a fresh smoke any time you want thanks to its long lasting freshness and preservation of all Dream Catcher Pipe Tobacco blends. 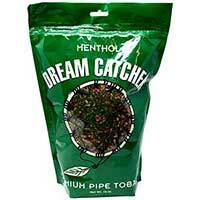 Dream Catcher Pipe Tobacco Mellow is just slightly milder than the classic blend, but still a joy to smoke. Classic delivers an even smoke with every draw and is rich and robust when inhaled. Menthol is smooth and minty as it refreshes your senses. It’s non-aromatic blend that isn’t harsh or too mellow, making it just right for any smoker who enjoys a minty flavor.